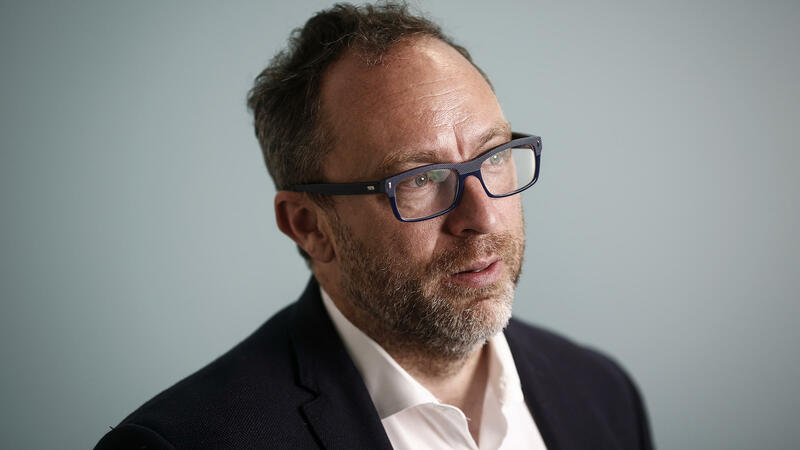 Jimmy Wales, co-founder of the crowdsourced encyclopedia, has been thinking about how to tackle the problem of "fake news." On Thursday, he delivered a keynote address on "the future role for evidence-based journalism" at the Westminster Media Forum, an international conference organized by the British Parliament. In the face of false information, Wales still believes that the more open and connected people are online, the better things will be for everyone. "In this era, where we've seen the rise of these fake news websites and so forth, Wikipedia has had almost no problems with this at all," Wales says. "Simply because our community is quite — you know, it's their hobby to debate about the quality of sources, and it's very difficult to fool the Wikipedia community with this." Yeah, well, that's just human life. All of us have a few idiot friends, and now they can share stuff on Facebook. The thing is, it's easy to be a little bit condescending about these people and to joke about idiots sharing nonsense. But the truth is, in free societies, people have a right to not be interested in the news. But when you're not that interested in the news and you do decide, "hey I think I want to find out some information," you still deserve to get quality information. And that's what we've really been lacking. A lot of people say they've lost trust in the media --they think everything is propaganda. And then it becomes very hard to come to any kind of a consensus in society, where we say, "well look, you and I disagree on a certain policy, but here's some facts underlying it," and we could at least agree on those facts. Whereas now, I feel like a lot of people are just adrift — they don't know what to believe. It's not required that everybody do it. As long as some people in our social circles are vigilant about this sort of thing, they can raise the alarm. I'll give an example: I nearly posted something. So here was a story that said "scientists have confirmed that if your cat was big enough, it would eat you." And that's a funny story, right? And we all kind of, we kind of believe it about cats, right? And I was about to share it to my daughter, and I just thought, "I'm gonna Google this quickly." And I did, and what I found was, it linked to an original study. I opened that PDF, and I looked through it, and you know what? The study absolutely said nothing of the sort. So I didn't share it, and that was a good thing. And I felt like, "phew, I nearly got duped by a great story." I mean, that's the thing: A lot of the things that do go viral, they go viral because you hear it, and you chuckle, and you're like "that's great." And it confirms something you believe is probably true anyway, so you just blast it off, and you've just been fooled. Art Silverman and Courtney Dorning produced and edited the audio story. Sydnee Monday adapted it for the Web. How do you tell what's real from what's not on the Internet, especially when paid foreign agents and political operatives are working hard to create believable stories that are complete fiction? This is something Wikipedia co-founder Jimmy Wales has been thinking about. This week, he delivered the keynote address at an international media forum on the topic, and he joins us now from London. Welcome. SHAPIRO: I think a lot of the Internet giants - Facebook, YouTube, Wikipedia - were founded on a kind of idealistic hope that the more open and connected people were online, the better things would be for everyone. Do you still hold that belief? WALES: Yeah, very much. In this era where we've seen the rise of these fake news websites and so forth, Wikipedia has had almost no problems with this at all simply because our community is quite - you know, it's their hobby to debate about the quality of sources. And it's very difficult to fool the Wikipedia community with this. SHAPIRO: The Internet has certainly had a problem with this. And some would say it is a problem of too many people having too much access being able to offer too freely ideas that are completely made up. WALES: (Laughter) Yeah, well, that's just human life. All of us have a few idiot friends, and now they can share stuff on Facebook. The thing is, it's easy to be a little bit condescending about these people and to joke about idiots sharing nonsense. But the truth is, in free societies, people have a right to not be interested in the news. But when you're not that interested in the news and you do decide, hey, I think I want to find out some information, you still deserve to get quality information. And that's what we've really been lacking. SHAPIRO: There is now so much money and power resting in the distortion of the narrative, whether you're talking about a country like Russia acting in its geopolitical interest or a political activist who's willing to spend millions of dollars to get someone elected who will pursue a specific policy. When there is that much at stake, aren't the people who are fighting for factual accuracy going to be forever outgunned? WALES: We're getting there. I mean, a lot of people say they've lost trust in the media, and they think everything is propaganda. And then it becomes very hard to come to any kind of a consensus in society where we say, well, look; you and I disagree on a certain policy, but here are some facts underlying it, and we can at least agree on those facts, whereas now I feel like a lot of people are just adrift. They don't know what to believe. SHAPIRO: Is there one step that you think people could do that would go some distance towards undoing some of this problem? WALES: Maybe one step that a lot of people could do is immediately take a more skeptical attitude towards things that you're sharing online. Just take a second, and look in a search engine. Check some of the keywords and terms, and just make sure you're not adding to the problem. SHAPIRO: Do you think hundreds of millions of Americans are actually going to do that? WALES: It's not required that everybody do it. As long as some people in our social circles are vigilant about this sort of thing, they can raise the alarm. I'll give an example. I nearly posted something. So here was this story that said scientists have confirmed that if your cat was big enough, it would eat you. And that's a funny story, right? SHAPIRO: (Laughing) It's a great story. WALES: And we all kind of - we kind of believe it about cats, right? WALES: And I was about to share it to my daughter. And I just thought, I'm going to google this quickly. And I did. And what I found was it linked to an original study. I opened that PDF, and I looked through it. And you know what? the study absolutely said nothing of the sort. So I didn't share it, and that was a good thing. And I felt like, whew, I nearly got duped by a great story. I mean, that's the thing. A lot of the things that do go viral, they go viral because you hear it, and you chuckle. And you're like, that's great. And it confirms something you believe is probably true anyway. So you just blast it off, and you've just been fooled. SHAPIRO: That's a great story, but I can also imagine a lot of listeners saying, I would never have taken those steps - open a PDF, read a scientific study. I see something funny on Facebook. I send it to my kid. WALES: (Laughter) Yeah, well, think again. You might be sharing fake news. SHAPIRO: Jimmy Wales, thank you so much for talking with us today. SHAPIRO: He's the co-founder of Wikipedia. And this week, he gave the keynote address at the Westminster Media Forum titled "Next Steps For Tackling Fake News." Transcript provided by NPR, Copyright NPR.